Practicing is the act of rehearsing a skill or behavior over and over, or engaging in an activity again and again, for the purpose of improving or mastering it. How many times have we heard, "Practice Makes Perfect"? What if you are repeating behavior incorrectly over and over, does practice still make perfect? I think not. This might just be the most major piece of misinformation I was ever taught in school! Used by permission from the creator, Mark Stivers. If you have ever taken formal archery lessons, you'll know that there are certain steps to shooting an arrow out of a bow to make it not only fly true to hits its mark, but to have a safe and rewarding experience. The physics of archery show us that if you execute each shot following each of the steps perfectly (or near), the arrow will go in the nearly exact same spot every time. If you introduce a variable such as wind, or lose concentration so as to not take the shot perfectly, the arrow will miss. 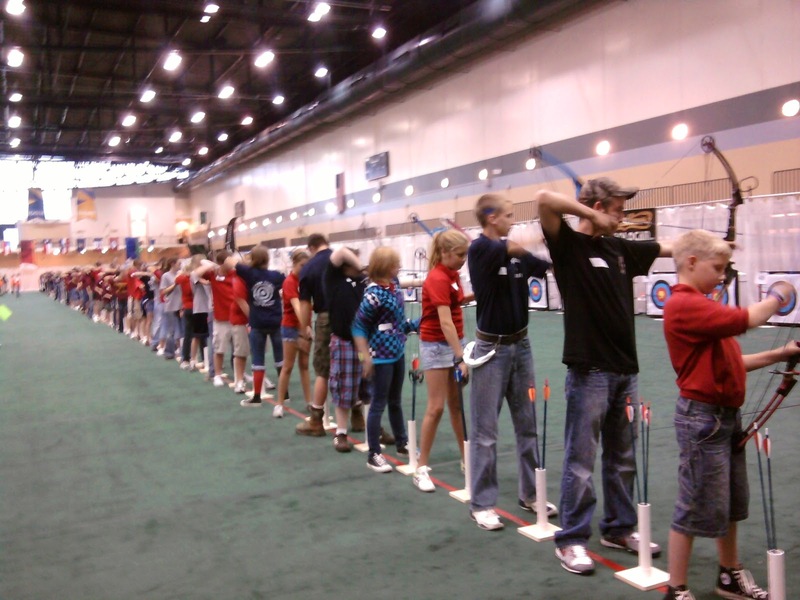 In the photo below, 100 students line up shoulder to shoulder at the 2009 National Archery In The Schools Program (NASP) World Tournament in Orlando, Florida. In NASP, all of the equipment is identical except for color. The difference measured in competition is the ability of the shooter, and how they have learned to follow each of the steps as near to perfect as possible in order to hit the 10 ring or bulls-eye at 10 or 15 meters. Perhaps we should say, "Perfect Practice Makes Perfect"? I see my young archers and other shooting sports kids week after week practicing their skills, and while some are taking short cuts, not working on each step to perfection, others are following the steps, and their coaches advice, and it shows!